When you select Tim Albrecht and Your Remax Team to market your home we make a commitment to you. We commit to implement the “Tim Albrecht Guaranteed Marketing Plan” which has resulted in hundreds of satisfied clients, sellers and buyers alike. Every member of our Team is thoroughly trained with over 70 years of combined knowledge in the Real Estate market. We want you to know exactly what to expect when you appoint the Tim Albrecht Team to market your property. 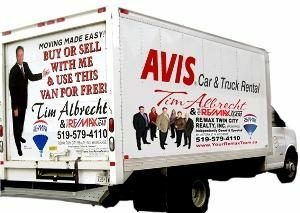 Included in our commitment to give you the best service possible, when you buy or sell a home with the Tim Albrecht Team you can use this Van for free.